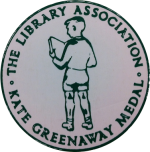 The Kate Greenaway Medal is a British award that was established in 1955 for distinguished illustration in a book for children. The medal is named after the popular nineteenth century artist known for her fine children’s illustrations and designs. No Award was given in 1955 or 1958. That is because no book was considered suitable. Learn more: official Greenaway Medal homepage. Tim arrives home from his vacation and finds his parents gone and the house closed up. He sets out to scour the world for them. A London balloon seller is taken on an amazing adventure when she goes to find her cat who has gone in search of fish. A remarkable compendium of information on chivalry, this is Pauline Baynes’ magnum opus. The Quangle Wangle lives in the top of the Crumpetty tree. The Jolly Postman is back, delivering Christmas greetings.